Whether your kitchen faucet has started to drip or your bathroom faucet has stopped working, faucet problems can be a real hassle. At Robins Plumbing, Inc in Glendale, AZ, our plumbing team is well versed in the common types of faucet issues that are known to pop up in homes and commercial businesses. 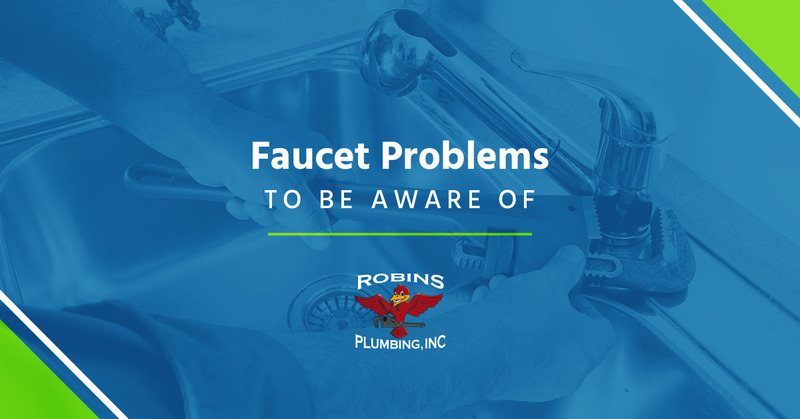 In this blog, we’re going to discuss some common faucet issues you should be aware of, and when it’s time to call your local plumber. Was there a time when your kitchen faucet pumped out water like a champion? If those days are long gone, you may be struggling to effectively wash dishes in the kitchen sink. If the water in your sink is pumping out a weak water stream, you may be suffering from a clogged aerator. This often occurs when minerals in water, such as calcium, gets deposited into the aerator. If your sink is showing signs of low water pressure, contact your local plumbing company. If you’ve started to notice rust around your faucet, call the professionals at Robins Plumbing, Inc right away. Rust occurs when your metal faucet is exposed to oxygen and moisture for an extended period of time. Noticeable rust is not good for your water quality or your health, so it’s important to get this issue fixed in a timely matter. If no water comes out of the faucet when you turn it on, this is likely due to sediment buildup. This common faucet problem may also be attributed to outdated valves that can be found in older faucet models. Most standard faucet designs are made with a circular valve which is used to trap dirt and debris. Today, newer faucet models feature various chambers that can slow the buildup of sediment. The most common faucet problem is a dripping faucet. Not only is this issue annoying, it can increase the cost of your water bill. If left unattended, a dripping or leaky faucet can pool in the sink and eventually overflow. This can cause serious damage to your property, especially if water starts leaking onto wooden floors or furniture. This problem is likely due to a worn out or torn washer. These silicon-based seals can corrode over time, and damaged washers can cause a trickle in your water system. When you call your local plumbing company, they’ll be able to fix the issue by swapping out the old washer with a new one. As you can see, there are a handful of common faucet problems, and the more you know, the more likely you can remedy these issues before any serious damage occurs. At Robins Plumbing, Inc in Glendale, we’re proud to be a leading provider of faucet repair and replacement services throughout Arizona. Whether you’ve noticed your water pressure has weakened or you can’t seem to stop your kitchen faucet from dripping, our professional plumbers can help. Contact our team today to schedule an appointment.